I decided I would start my daily decluttering by tackling the dreaded junk drawer. I’ve written about it before (click HERE to read the previous post), and you would think that the problem might have been solved when we moved last month. Really, the easiest way to do away with a junk drawer when you’re moving is just to keep the essentials, trash the rest, and keep yourself from tossing stuff in a drawer in the new house. Oh, it sounds so easy. I think we were in the new house all of six hours when I started tossing random odds and ends and small semi-important items into an unused drawer in the kitchen–you know, things like sunglasses and car keys and cell phone chargers and postage stamps. I’m not quite sure what happened next, but things began to multiply. One pair of scissors became three pair. One roll of half-used scotch tape grew into two large rolls of clear packing tape. Need a pen? You’ll find six that work, three that don’t, and a mechanical pencil with just enough lead left to piss you off as it slides back up inside the pencil when you try to write with it. So, I rolled up my sleeves today and decided to officially end the tyrannical reign of the junk drawer. Unfortunately, I didn’t make it past the coupons. Steven and I have the best of intentions when it comes to coupons. Okay, maybe that’s a lie. 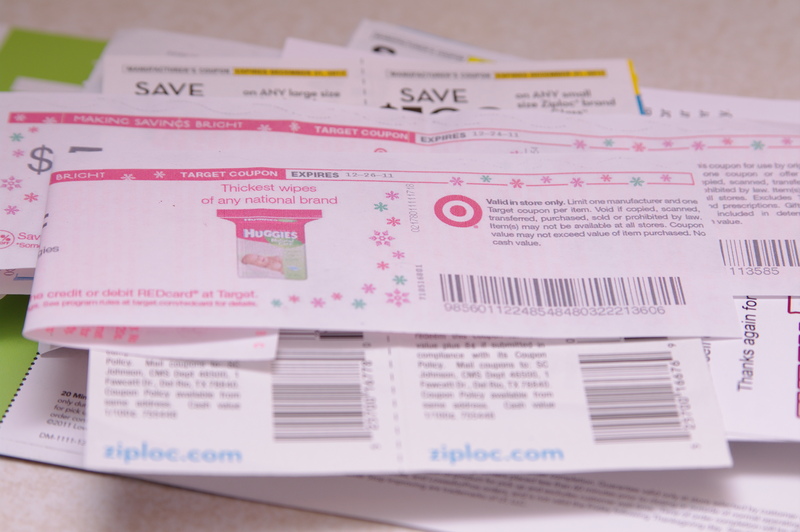 We like to save money when we can, and we like the idea of coupons. Unfortunately, neither of us really likes the reality of coupons. We won’t buy something just because we have a coupon for it. And, most of the time, we don’t have coupons for the things we actually need. Or, we forget them at home and then scold ourselves when we get to the checkout line, saying that we’ll just have to remember to bring them next time. But then they expire and we’re just out of luck. I have some friends that are into couponing, and I definitely feel a twinge of jealous admiration when I see them post on Facebook how they managed to buy $138.32 worth of stuff at their local Walgreen’s for just $12.50. I mean, how the hell do they do that? How many coupons did they clip? How much prep work did this entail? That is some crazy ninja couponing madness. Lord, it gives me agita just thinking about it. In this pile, there are maybe four coupons that are still good. Two expire tomorrow, and we can’t decide if we actually need the items or not. The rest, expired last year. Goodbye old coupons. Your days of cluttering my junk drawer are over. Previous Entry Welcome to Excavation 2012! Coupons are gaining popularity in the UK. A woman was interviewed by the press recently and even stated that she had been to the US a few times to learn how to save even more money couponing. If a flight costs about 750 dollars – she must do a lot of it! Whew! If I knew that couponing could save me enough money to justify overseas trips, I might give it a serious try myself! I wonder if the classes have paid off for her? She was sittiing on a two legged stool eating a pot noodle at the time – so i guess not! Shame. You didn’t get any coupon training at home. It was the same for me. When I would clip coupons I didn’t need them at the time and forgot about them. Sorry I didn’t do better in the coupon department!